Our programs depend on our enthusiastic volunteers. No experience with horses is necessary – we provide training. RCMP clearance is required. Experience with horses is not required as we provide a training day where volunteers will learn the volunteer roles and instruction on grooming and tacking the horses. Leaders are responsible for leading the horse around the arena or during trail rides. Side walkers will walk next to the horse and rider and are responsible for providing support to the rider. In addition, we always appreciate help to groom and tack the horses in preparation for the lessons. The lessons are one hour long, but we ask volunteers to arrive an hour before the lesson if they would like to prepare the horses. You do not have to commit to all the lessons, however we do ask that you give us as much notice as possible if you are unable to attend a lesson which you are scheduled for. We have two forms to fill out which can be found on our website or contact Sam (volunteerrundleriders@gmail.com). Please contact Sue at Inquiries@rundleriders.com for information. Our program is based at the Rocky Mountain YMCA Camp Chief Hector. In 2018/2019, lessons take place on Friday and Saturday afternoons, from May through September. NOTE: The map below is only to indicate location. Please do not contact YMCA Camp Chief Hector about Rundle Riders programs. Thank you! Alberta Equestrian Federation for its generous support that helped RRTRA to send two members to the CanTRA Mentorship Clinic, in April, in Lethbridge in Alberta. 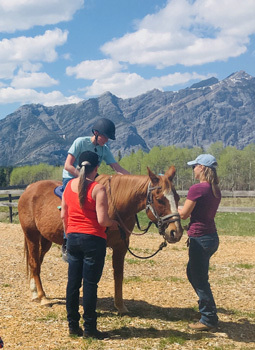 Participation in these clinics builds instructor and volunteer skills, as well as our connections with other CanTRA therapeutic riding programs in Alberta. We are always preparing for the Rundle Riders Therapeutic Riding program at Camp Chief Hector YMCA for the upcoming season. Rundle Riders Therapeutic Riding program has been very fortunate to facilitate our program in the Spring, Summer and Fall at Camp Chief Hector since 2000! Through the years we have seen some amazing achievements by the participants and we look forward to continuing on with new and returning participant’s horsemanship experience and skills.